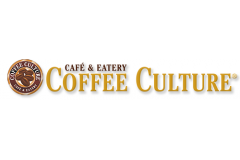 In July 2006 an exciting new coffee experience called Coffee Culture was born. Anyone who has traveled will recognize that Coffee Culture is designed as an Old World style coffee house where customers make it a frequent destination for conversation and relaxation. Coffee consumption in North America is over $18 billion a year. Coffee Culture aims to be your neighborhood destination. Your senses will tell you best – delicious taste, warm relaxing atmosphere and comfortable seating. As the name suggests, at Coffee Culture the coffee is great. We provide high quality whole roasted coffee beans and have them blended and roasted to our specifications to ensure each freshly brewed cup of coffee, espresso, latte and cappuccino is deliciously satisfying. We took it another step and offered baked goods which are made fresh daily, cakes, and appetizing grilled sandwiches and wraps. Coffee Culture Café & Eatery is a perfect spot to grab a quiet cup of coffee, hold casual business meetings and a place to take advantage of the café’s free wireless Internet access and plasma TV; a few sidewalk tables lend a Euro flair. There is more to this café than you might imagine, aside from great coffee and cozy ambiance. The friendly employees serve up all sorts of fresh gourmet foods: Breakfast bagels, Muffins and Pastries. For lunch and dinner, offerings include grilled sandwiches, soups and culture specialties. Late night desserts may just be the best part, with our decadent cakes you can never go wrong – what a perfect way to end the day.